Downsizing, layoffs, and frozen salaries mean challenging times for even the most cost-conscious penny pinchers. The current Consumer Price Index Inflation Calculator estimates that what we could buy with $100 five years ago now costs $113.23. Given that the cost of food is most Americans’ second biggest expense after the cost of housing, it’s crucial to have a money-saving mentality in the grocery store, particularly if you have diabetes. That’s because people with diabetes, on average, have medical expenditures that are approximately 2.3 times higher than those without diabetes, meaning that your resources must stretch farther. Savvy shopping ability is now a priceless skill! Putting a financial priority on healthy eating is a good investment of your limited dollars because nutrition is a key factor in diabetes control. Research has shown that following a meal plan based on the principles recommended by the American Diabetes Association can decrease your A1C (glycosylated hemoglobin, or HbA1c) by about 1% if you have Type 1 diabetes and by 1% to 2% if you have Type 2 diabetes. A lower A1C means less risk of the expensive and dangerous complications of diabetes such as kidney disease, eye disease, and nerve damage. Fortunately, a healthy meal plan for diabetes is the same as a healthy meal plan for the rest of the family: low-fat, high-fiber grains, beans, fruits, and vegetables with small portions of lean meat and other protein foods, such as fish and low-fat dairy products, and limited amounts of fats, sweets, and alcohol. No need to spend your hard-earned dollars on expensive “sugar-free” and “fat-free” foods or high-priced “diabetic” snacks. Just stick close to Mother Nature for the best choices for your body and your bank account. It’s a common misconception that healthy foods are more expensive. A stroll down the produce aisle can lead to sticker shock, but savvy shoppers know that bargains can be found. According to the Academy of Nutrition and Dietetics, a 1200-calorie meal plan based on the 2005 Dietary Guidelines for Americans costs $6.99 per person for the entire day and $6.33 per day if that person is a vegetarian. That’s just about the same price of a single, drive-thru “value” meal, which in addition to being financially costly is likely to be loaded with fat, sodium, and carbohydrate. Eating healthfully does require an investment of time to plan, shop, and cook foods that fit your budget and diabetes meal plan. But taking a few moments of your busy week to focus on planning and shopping earns you the benefits of healthier food choices and money in the bank! One of the most important tools you have for planning ahead is your personal meal plan. A number of meal-planning methods can be used as the basis of an individualized diabetes meal plan. Options include the Plate Method (www.platemethod.com), the exchange system (Choose Your Foods: Exchange Lists for Diabetes), or carbohydrate counting. No matter what method you use, a registered dietitian can help you determine the number of servings you need each day from each food group. This gives you the outline of your basic menus, which then becomes your shopping list. When you know your meal plan well, there’s no need to guess at what to buy and how much. Cook once, eat twice. To make the most of your time in the kitchen, consider “batch cooking,” or cooking and baking in large quantities and freezing portions for future meals and snacks. Also consider “planned-overs,” or buying enough of a main ingredient for several meals. For example, prepare a round steak for one meal, then use the leftovers in several different ways, such as in a stir-fry, fajitas, or vegetable–beef soup. Pick the right store. Different types of stores offer different types of bargains. For example, the warehouse club (such as Costco) is the place to stock up on nonperishable staples in large sizes. The supercenter (such as Walmart) has low everyday prices. And the neighborhood supermarket may be the best choice when time is tight or you need only a few items. Also consider a food coop if there’s one in your area. Prices at food coops are almost always lower than those at health-food stores, and the turnover of products such as whole grains, dried beans, nuts, and seeds is likely to be higher at a food coop than at a supermarket, so the quality and freshness of these items may be superior. Signing up for a CSA (which stands for Community Supported Agriculture) may be another way to get fresh, high-quality produce and other farm products at reasonable prices. In a CSA, consumers buy “shares” from a farmer or group of farmers, then receive a box or bag of seasonal produce each week throughout the farming season. To be sure a CSA will be economical for you, before you sign up, ask for an estimate of how much food to expect each week and a list of what produce to expect when. If possible, avoid shopping in corner markets and convenience stores; not only do they tend to have a limited selection of healthful options, but they also tend to have higher prices because of the convenience they offer. Make a list. The longer you spend in the grocery store, the more you will buy, so always shop with a list to guide you and help curb impulse purchases. To get through the store even faster, organize your shopping list to match the aisle-by-aisle layout of the store. Taking the time to make a list will also help you avoid costly trips back to the store later in the week for items that you forgot during your first shopping trip. Keep records of your shopping success. To become familiar with the best bargains and places to shop for your most commonly used items, jot down notes about your shopping results, and maintain your own personal price book. Note the cycle of sales in nearby stores. For example, in most stores, items such as chicken breasts or canned vegetables are on sale every six weeks. If you note the dates of these sales, you can stock up and freeze or store your bargains for future use. Clip coupons for foods you eat. Only clip coupons for foods you usually eat; otherwise, you may end up spending more on a slightly discounted, expensive item than you would on a comparable, nondiscounted, low-price item. These days, coupons can be found not only in your local newspaper but also online, on food manufacturers’ Web sites, and even on your cell phone! A good strategy for using coupons is to wait to redeem them until an item is on sale. Because most coupons are good for six weeks to three months, watching for a sale makes it worth the wait. 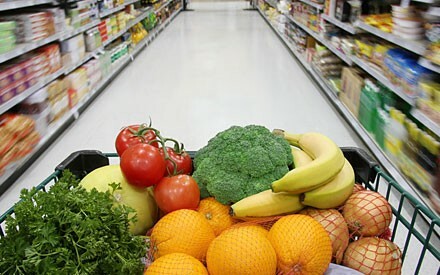 One source of online coupons is www.thegrocerygame.com, which provides members with a grocery list for a chosen supermarket, giving the lowest-priced items coupled with store savings and manufacturers’ coupons. There is a fee to use this service, but it may save you a chunk of change in the long run. Other online food coupon resources include www.redplum.com and www.coolsavings.com. To learn more about getting coupons on your cell phone, go to www.cellfire.com. Savvy shoppers are selective, not snooty. They’re looking for nutritious foods at reasonable prices, not impressive brand names or fancy packaging. They know that the most important part of any food packaging is the Nutrition Facts panel, which lists the serving size, number of servings per container, and amount of fat, protein, carbohydrate, fiber, and sodium per serving. Savvy shoppers save money by buying only those products that provide the type and amount of nutrients they need. Shop with a basket. Another way to limit impulse buys is to use a basket instead of a cart, especially if you need only a few items from the grocery store. Before shopping carts were invented, consumers stopped shopping when their baskets became too heavy to carry, meaning they brought fewer items to the checkout counter. Shopping carts were designed by grocers to enable consumers to buy large quantities of food – and to spend more money. Look up and down. Foods on eye-level shelves are the most expensive. Look above and below these shelves for lower-priced items and bargains. Focus on the outer aisles. In most grocery stores, fresh fruits, vegetables, meats, and dairy foods are found on the perimeter of the store, while highly processed, less nutritious – and often more expensive – choices clog the center aisles. However, don’t forget to seek out the good stuff in the center aisles, like old-fashioned oatmeal, whole grains, dried beans, canned tomatoes, frozen vegetables, and peanut butter. Bigger is not always better. While a jumbo-size container may cost less per ounce, your purchase is no bargain if you can’t use all of it before its expiration date. And sometimes the bigger container doesn’t cost less: Often, the cost of two half-gallons of milk is less than a one-gallon jug. Go generic. Private-label or generic items can save you as much as 30 cents on the dollar. They are often produced by brand-name manufacturers, so their nutrition content, taste, and quality can be quite good. Try a small package first to see if you like a product. If it’s good, stick with the generic. If you don’t like it, don’t buy it again: You don’t save any money on food that gets thrown out. Convenience is costly. Preprepared items such as grated cheese or frozen chopped green peppers cost more per ounce than blocks of cheese or raw green peppers. To save money, plan to do some of the grating, chopping, and other preparation of ingredients on your own. For example, since regular oatmeal costs less and contains more nutrients than instant oatmeal, take a couple of extra minutes to microwave regular oatmeal, rather than heating water in the microwave and adding it to a packet of processed oats. Location, location. The same product may cost more (or less) depending on where it’s stocked. For example, a 20-ounce diet soft drink may cost $1.49 at the checkout lane, while a few feet away in the soft drink aisle, you can snag a 2-liter (68-ounce) bottle of the same soda for $1.50. Steer clear of “special” foods. Carefully compare the nutrition and price information on special “diabetic” foods. On a recent trip to the store, a savvy shopper noted that one piece of sugar-free peppermint hard candy cost 13 cents, while one piece of regular peppermint hard candy cost only 2 cents. The bottom line nutrition-wise? Both had the exact same amount of carbohydrate: 5 grams per piece. Which would you choose? Bargains abound for savvy shoppers in every aisle of the grocery store. You just need to know where to look. Produce. If you’re purchasing bagged fresh vegetables, weigh a few bags, and choose the heaviest. There can be as much as a 3/4 pound difference between two 5-pound bags of potatoes. Bread. Use day-old bread to make bread crumbs, French toast, croutons, and stuffing. Day-old pound cake is fine to use for a layered fruit trifle dessert. Beans, rice, and pasta. Beans are known as “poor man’s meat,” but savvy shoppers know that beans are “smart man’s meat,” as well. Dry beans triple in volume when they’re soaked and cooked. A 1-pound bag will make six 1-cup servings. Try different bean varieties to see which taste best to you. When buying rice, buy plain rice to cook and season yourself. Instant or quick-cooking rice and seasoned rice mixes cost almost three times as much. Pasta shapes are interchangeable in recipes. Choose the least expensive shape and use it in place of a more expensive variety that has a similar shape and size. Meats. Minimize the amount of meat in your meals to minimize costs. In most recipes, you can reduce the amount of meat by a quarter without it being missed. Use meat as a complement, not the focus, of your meals several times each week. Breakfast cereal. Packaging costs money. Buy unsweetened cereal in bags, not boxes. Snacks. Save 25 cents per serving by using air-popped popcorn kernels rather than the expensive microwave-ready bags. You’ll save not only money but fat and calories as well. Dairy. Instead of buying single-serving containers of fruited or flavored yogurt, buy a quart of plain yogurt, and separate it into 6- or 8-ounce servings yourself. Add your own fruit for a better buy and more nutrition. Frozen foods. Vegetables frozen in butter or cream sauce cost twice as much as plain frozen vegetables. Buy bags of plain frozen vegetables and add your own seasonings to save money as well as fat and calories. At the checkout counter. Take advantage of store savings cards, rebates, and rain checks. Know your store’s policy for pricing mistakes. Often, if a price is entered incorrectly, you will receive the item at no cost! Benjamin Franklin once said “The art is not in making money, but in keeping it.” In these tough economic times, you need to stay supermarket savvy when facing the combined costs of diabetes and soaring food prices. Let the bargain hunting begin! Patti Geil is a certified diabetes educator and freelance writer in Lexington, Kentucky. Alissa Heizler is a Senior Medical Science Liaison for Amylin Pharmaceuticals, Inc., in Island Park, NY.